Safety / Propane Safety | Griffin Oil and Propane | Suffok Energies, Inc.
What should I do if I run out of gas? Do not let yourself run out of gas, it creates a serious safety hazard. If an appliance or gas line is left open, a leak could occur when the system is recharged. Also, any pilot lights on your appliances will go out and have to be relit. In any “Out of Gas” situation, a Leak Check is required before the gas can be turned back on and put back into service. 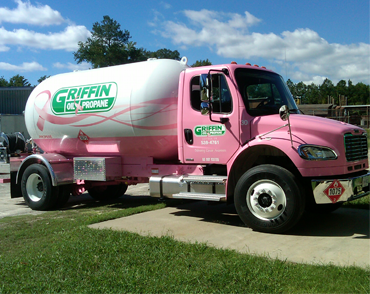 A Leak Check must be done by a Griffin Oil & Propane technician. I ran out of propane and/or experienced an interruption of service. Why do you have to do a Leak Check before turning the gas back on? National Fuel Gas Code (NFPA 54) states any “Out of Gas” situation or other Interruption of Service must have a completed Leak Check before the propane system can be restarted and put back into service. If I smell propane in my home or business, what should I do? If you smell gas or fear you have a gas leak, please follow these instructions: No Flames or Sparks, Leave the Area Immediately, Shut Off the Gas Tank, Report the Leak to Griffin Oil & Propane (if unable to contact us, Call your local Fire Department by dialing 911), do not return to the building until a qualified technician checks your entire propane system and its leak-free. Should I use a Propane Gas Detector? Under some circumstance, you may not smell a propane leak. Propane Gas Detectors sound an alarm if it senses propane and can provide an additional measure of security. You should consider the purchases of one or more detectors for your home. Keep in mind the following: you should only by units listed by Underwriters Laboratories (UL), follow the manufacturer’s instructions regarding installation and maintenance, and never ignore the smell of propane, even if a detector is not sounding an alarm. Should I use a Carbon Monoxide Detector? To avoid the risk of Carbon Monoxide poisoning, install an Underwriters Laboratories (UL) Listed Carbon Monoxide Detector on every level of your home. You cannot taste or smell CO, but it is a very dangerous gas that is produced when any fuel burns. High levels of CO can come from appliances that are not operating correctly or venting systems that become blocked and can be deadly. If you suspect CO is present, get everyone out or the building immediately and call 911 or your local fire department. If it is safe to do so, open windows to allow entry of fresh air and turn off any appliances you suspect to be releasing CO.